You may be wondering what Coyotes have to do with an urban backyard wildlife habitat. So, here it is: If your neighborhood offers plenty of good cover for hiding–wooded or brushy areas, thickets, tall grasses–a Coyote may be visiting your yard nightly. It might drink from your dog’s water dish, pounce on mice nibbling up spilled birdseed, go fishing in your pond, and search your compost bin for dinner leftovers. No? Well, look again at the Coyote above; like a dog, it’s relaxing on a lawn bordered by houses! A study1 of 105 cities, medium-sized to large, determined that 96 of them had Coyote populations, including New York City. Coyotes, Canis latrans, are native to North America. Fossil evidence shows they evolved from a coyote-like carnivore that existed five to six million years ago in the Miocene to early-Pleistocene Epochs. They’ve existed as we see them today for at least a million years. Their scientific family, Canidae (CAN-uh-dee), includes wolves, foxes, jackals, dingoes, dogs, and other dog-like animals. Originally, Coyotes inhabited the grasslands of the northwestern United States. As humans entrenched themselves in their habitat, Coyotes were forced to find new areas. Along with that, ill-conceived, government-sponsored extermination of their most dangerous natural predator, the wolf, along with declining numbers of bears and mountain lions, provided a big advantage to Coyotes. The disrupted, growing populations of these smart and adaptable animals saw them fanning out in all directions in the ensuing years. 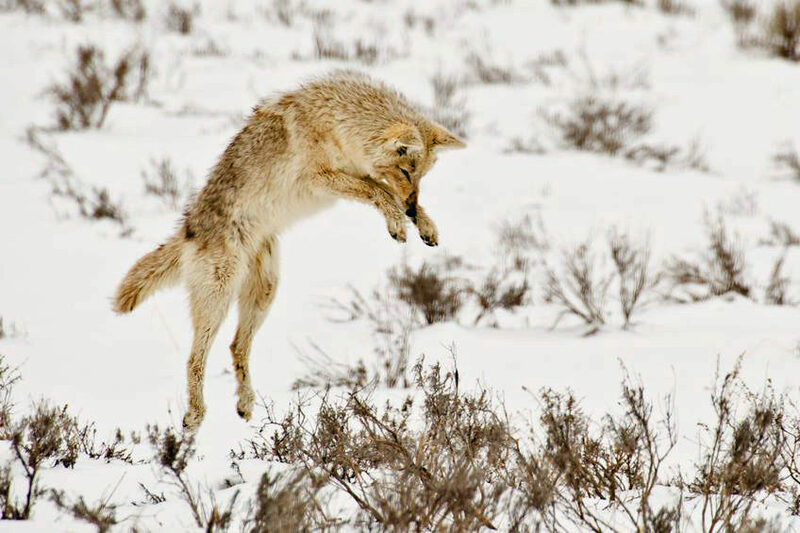 There are 19 Coyote subspecies, and now one or another can be found just about everywhere, from mountains to deserts. They’re in every state but Hawaii and extend up into Canada and down through Mexico into Central America. Coyotes are still on the move–right into our cities. Adult Coyotes generally are 30–40 inches long (76–102 cm) and stand 15–20 inches tall (38–51 cm) at the shoulder. The tail is about 16 inches (41 cm) long. They weigh 15–44 pounds (7–20 kg). Males are a bit larger than females. 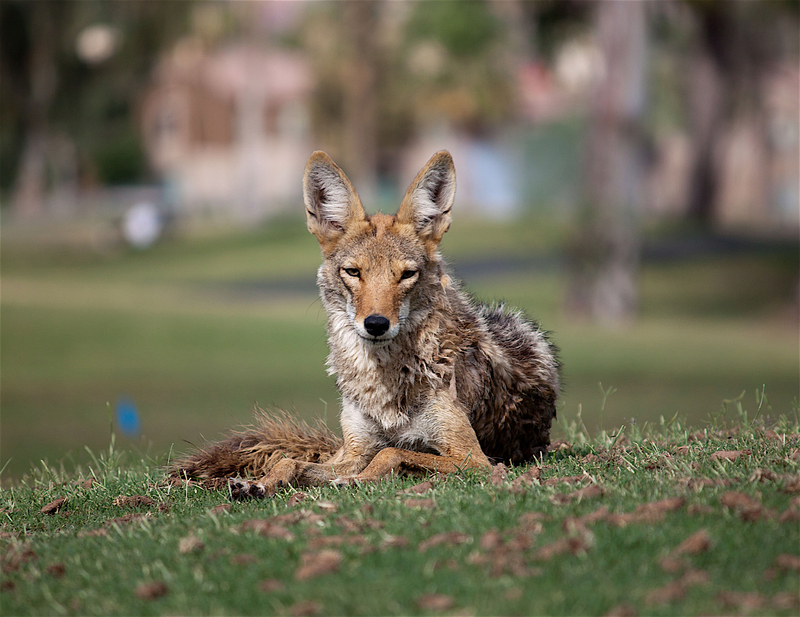 Coyotes living in desert and prairie environments are smaller than their mountain-range kin. Coyotes have a thin face with yellow eyes and a black nose. Their eyes are on the front of the head, like a human’s, which gives them binocular vision. The ears are large, yellowish, triangular and held upright. Their body is lean, with a black-tipped, bushy tail usually carried down, even when running. It’s raised to a horizontal position during shows of aggression. Warm-climate Coyotes are grayish-brown, yellowish-gray or tawny. A dark stripe runs down their back. Those living in colder areas have a darker coat. They have five toes on their front feet, and the back feet have four toes and a dewclaw (a rudimentary fifth toe). Coyotes have strong legs–they can run up to 40 miles per hour (64 kmh) and easily jump 6-7 feet (1.8 m) high, which means a backyard fence needs to be that high to keep them out. They’re also excellent swimmers. A Coyote’s senses are all excellent, but their sense of smell triumphs over the others. For comparison, a dog can smell some odors in parts per trillion and coyotes can smell at least that well. Coyotes are nocturnal but sometimes come out in the daytime. They’re shy by nature, very wary of people, and will usually run away if they think they’ve been seen. Some of those living in urban areas, however, have lost their fear of humans. 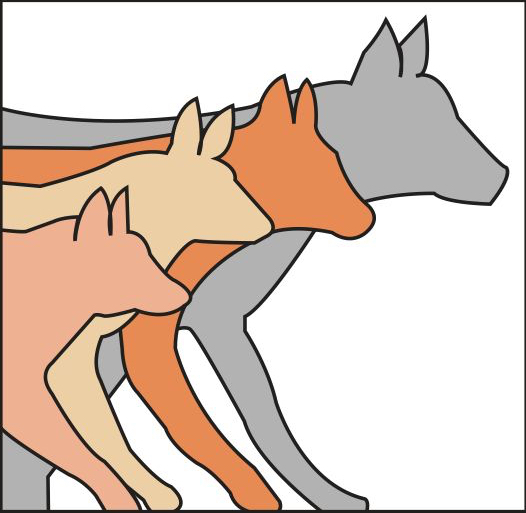 Coyotes form packs, usually a mated pair and their offspring, but there may be unrelated others. Individuals may be forced out of a pack if they’re diseased, injured, old or food is scarce. Being forced to live alone can be life-threatening since they lack the pack’s protection and also lose an advantage in bringing down larger prey. ScientificAmerican.com calls Coyotes the “. . . New Top Dogs.” because they’re smart, resourceful, clever, and adaptable. Research shows Coyotes are bigger and stronger than ever before and have survived through ingenuity and exploitation of human actions affecting their environment.2 They often outsmart other wildlife and humans, alike. For example, they’re known to create diversions to lure picnickers away from their food. And, they sometimes drive prey toward other Coyotes waiting to ambush them. They generally live in packs but can adapt if they must live alone. These canines are beneficial predators that help keep wildlife populations, such as rats, mice, ground squirrels, and rabbits under control. Because they eat meat, they’re considered to be carnivores, but in practice, they’re omnivores. In urban areas, their main diet is meat, but they also eat fruit, vegetables, and insects. They also eat fish and carrion. In a city with Coyotes, don’t leave pets outside alone. A Coyote can weigh up to 44 pounds (20 kg) and easily take a small animal down, For the Coyote, it isn’t vindictiveness toward the animal, it just needs to eat, and a dog or cat is pretty easy prey. Fast runners–up to 40 miles per hour (67 kmh)–they hunt by day or night and usually alone, but sometimes rural Coyotes will act as a group when trying to take down a large animal, such as a deer. Coyotes have a bad reputation among farmers and ranchers who occasionally lose young, old or ill livestock to them. Coyotes use dens for sleeping and raising their young, but seldom dig their own. They look for a suitable space with more than one entrance in rock crevices, caves, hollow logs, another animal’s abandoned den, or even thickets. In urban areas, they may den in old sheds or large drain pipes. They’ll use a good den for years. They don’t hibernate, are active year-round. Gestation is about 63 days. Three to nine pups are born (usually six) in a den prepared by the mother. The newborns are fuzzy and helpless. Their eyes are closed for about 14 days. Once they can see, the pups begin to venture outside of their den, but stay in a group. Their father plays a helpful role by bringing food to the female while she’s nursing, as well as regurgitated food for the pups. Pups start eating meat at about three weeks. At six to eight weeks they stop nursing. If the mother dies before the young can eat meat, they’ll perish from starvation. If they’re able to eat meat, the father will feed and raise them. A mother, on the other hand, can rear them alone if she must, although it makes her job harder. If there are other pack members (usually older offspring), they’ll also help raise the pups. At six to 10 weeks the mother begins to take her pups out hunting. It’s at this time that Coyotes are most visible to humans. At six months pups are nearly full grown and hunting on their own. Within a year (sometimes two) they leave to claim a territory, find a mate and begin a pack of their own. Only five to 15 percent of juveniles live to adulthood. If they can survive that long, they might live ten to fifteen years, although six to eight is typical. In captivity live up to 18 years. Coyotes are susceptible to rabies, but it’s uncommon. Life is tough for young Coyotes. Their rates of distemper and roundworm take a heavy toll. 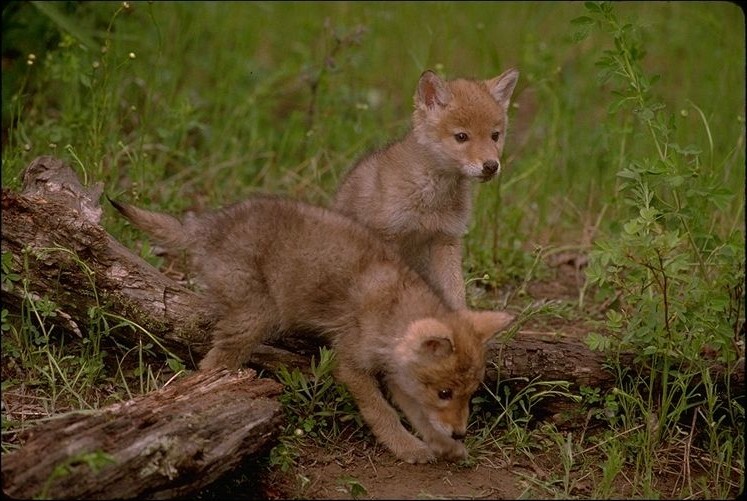 Pups are prey for hawks, owls, and occasionally even neighboring Coyote packs. Adults are preyed on by Black Bears, Mountain Lions, and wolves, but the presently have only one predator of real consequence: humans. Hunting, traps, poison, and automobiles take a significant toll. Can wildlife be too smart for their own good?